Red cedar is one of the most recognizable trees in the southern landscape. 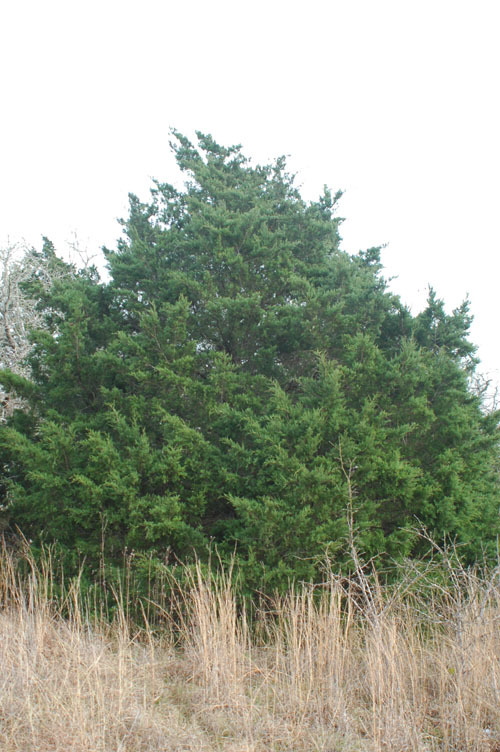 Its dense, pyramid form and scale-like, evergreen leaves are frequently seen in areas of rocky, limestone soils. Junipers are typically small to medium trees at maturity, reaching heights of 40 to 50 feet. The fruits are berry-like, bluish-grey with a waxy coating. The reddish brown bark is fibrous and exfoliates in thin strips. 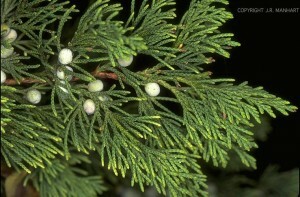 Eastern red cedar is known for the moth repellant properties of its heartwood. The wood is used for lining closets and chests and for animal bedding. Once used as the major source of wood for pencils. Oils from the leaves and the wood of Junipers are used in scenting soaps, perfumes and in several medicinal preparations. Junipers are beautiful ornamental plants imparting a park-like quality to the landscape. On a negative note, cedars are the host plant for cedar-apple rust, a fungus that does little harm to the cedar but is extremely detrimental to both wild and cultivated apples.